Cats can be experts at hiding - and some cats love to spend time by themselves, hidden away! However, if your kitty seems to always be missing somewhere in the house, and appears stressed or anxious, it could be a sign that something’s not quite right. It’s important to consider why your kitty might be hiding, and to identify and solve any issues. 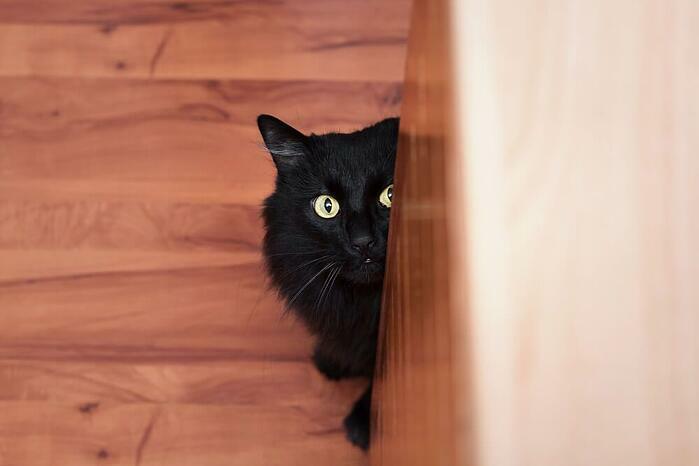 Here are a few common reasons why kitties hide - and some tips on what you can do about it! Do you sometimes wish you could curl up and hide away when you feel stressed? Our kitties can feel the same! So if your furry friend seems to always be out of sight behind the sofa, under beds, or in any small space they can find, it may be a sign of stress, fear or illness. This is particularly relevant if your pet is usually a sociable, friendly animal. Watch out for sudden changes in behavior, as this can indicate that something is wrong. 2. There are new people nearby! If you have guests, visitors or even new people living with you, your kitty might take some time to get used to them. Hiding is a common reaction to a change in circumstance, even if that change is only small. If your cat does hide when new people are present, never force them to come out - even if you’d love to show them to your guests! It’s important to give your kitty time to feel safe. They’ll come out when they’re ready. Unfamiliar or loud noises in the house (such as housework) or nearby. Remember that your cat has incredible hearing, so may react to sounds that aren’t loud to you! New people in the house, such a new baby or guests. Bigger changes to the environment. Have you redecorated, or moved to a new house recently? If so, give your pets time to settle in, explore and adjust. It can help if you give your cats their own accessible space to feel safe in, with blankets, toys and hiding spots - at least while you unpack or decorate! Other new pets or animals in the house. If this is the case, be sure to introduce new furry friends carefully and gradually to encourage a happy household! As even temporary changes and kitty stressors may cause your cat to feel threatened and hide, it’s important to know how to calm your kitty and entice them out. Be sure to give them time. Never force your cat out from their hiding place as this can increase their stress. Instead, let them have their escape. Solve any stressors in your cat’s environment - a happy kitty will be less likely to hide away. Tempt them out with treats or toys! Food and fun may encourage your cat to be more visible and build their confidence - but be sure to respect their needs if they decide to hide again. If you’re introducing new kitty friends, make sure introductions are gradual to keep both animals calm and friendly. Cat conflict can often result in stress and hiding, so make sure your pet isn’t hiding as a result of another cat’s aggressive or bullying behavior. If your cat is still a little uncertain in their environment, using FELIWAY CLASSIC Diffuser can help to calm your pet. Proven to help cats feel happy at home, using FELIWAY CLASSIC can comfort them and encourage them to leave their hiding place more often.